If you’re using Pipedrive, you already know that it’s a superb sales CRM, allowing you to define a clear process for your clients and prospects. But what if you’d like to save even more time and effort by integrating it with your marketing as well? The smart way to do that is to use best-in-class 3rd party marketing automation tools that integrate seamlessly with Pipedrive. We’ve done the hard work of reviewing many possible options, so it’s easier for you to decide on your stack. Before we jump in, let’s take a step back and ask: what exactly is this “marketing automation” that we’re looking for? This sounds smart, but also seriously generic. Do they mean all marketing tasks and processes? Perhaps we’ll get there with the AI revolution one day, but in the meantime, marketing automation is probably best understood as a set of specific marketing tasks. Marketing Reporting – tying it all together and seeing what generated sales/revenue, without having to manually recreate charts and graphs every time. This isn’t an exhaustive list, of course, but they’re the main things most businesses are looking to do well. Simply getting these fundamentals right goes a long, long way. Let’s start with email, which is still considered one of the most powerful and effective marketing channels for any business. 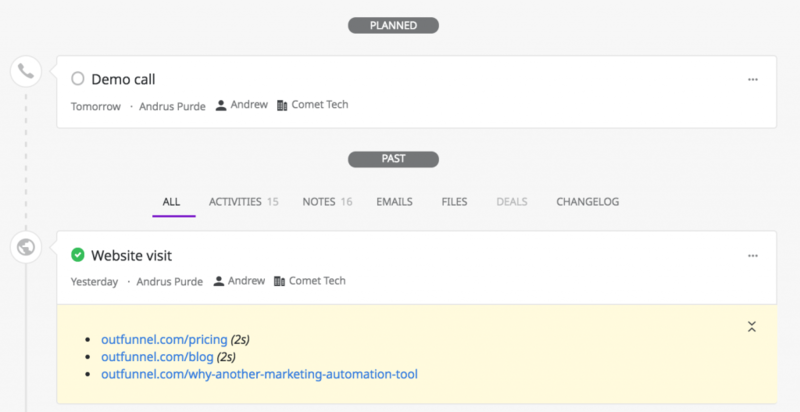 Keeping that in mind, we’ve tested many tools that do email automation for Pipedrive. 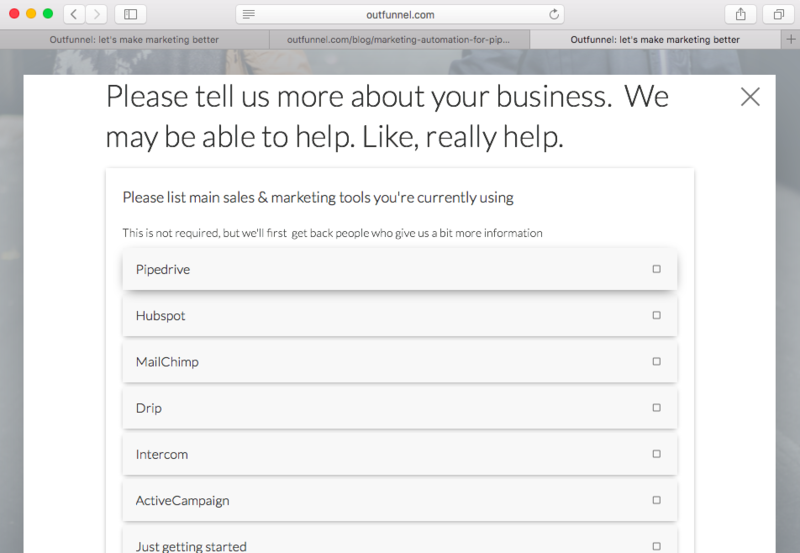 Pipedrive and Mailchimp do work well together. Pipedrive’s native Mailchimp integration lets you easily filter out a specific group of users in the Pipedrive list view, and then add them to a Mailchimp list with the press of a button. There’s just one problem: the data about opens and clicks remains in Mailchimp, and does not loop back to Pipedrive. So if your sales team wants to know who opened or clicked, they’d have to visit Mailchimp – which is an extra step they might not always take, especially if they have to first go through the marketing team. 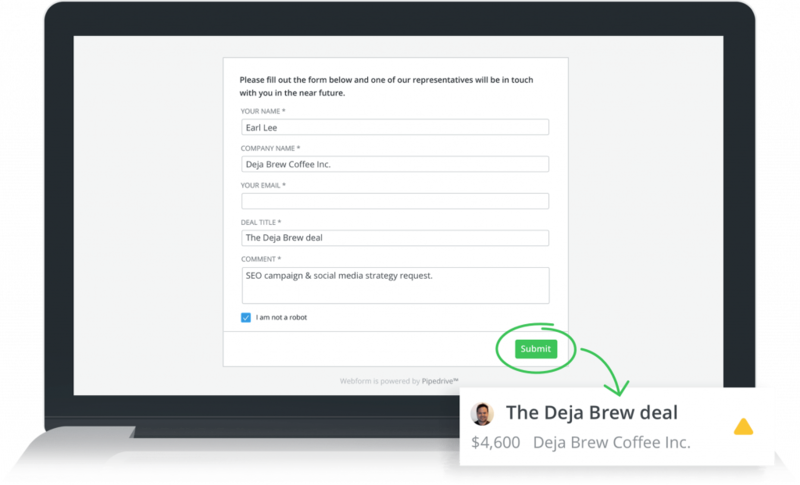 Displaying responses to email campaigns in Pipedrive. Creating new Deals or Contacts based on email opens and clicks. Triggered email sequences where email flow and content depends on Pipedrive sales stage or email behavior. Keeping your email and CRM list in sync. Little insights, apart from campaign stats in Mailchimp. Drip’s native integration with Pipedrive creates new Deals from your Drip subscribers based on the trigger of your choosing. For example, you may want to create a new deal for people that have completed a particular email Campaign or that have opened or clicked specific emails. Drip itself is great for elaborate event-based email sequences, so this tool could be very handy if you have a large list of leads and enough content+ tracking to be able to provide complex email journeys. The downside is that it’s not trivial to get data from Pipedrive into Drip. You can use Zapier as a duct tape between the services, create a custom integration based on API’s of both products or use a 3rd party syncing tool such as PieSync. Triggered email sequences where email flow and content depends on email behavior, pages visited and other data (once you’ve figured out how to sync with Pipedrive, that is). Multi-channel flows ie. when you also need to send postcards, text messages, etc. It’s a solid leads database to complement your customer database in Pipedrive. Keeping your email and CRM list in sync, unless you invest in building an API-connection or subscribe to a 3rd party syncing service. Drip seems to have pivoted to ecommerce marketing as of early 2018, so it’s unlikely they’ll create advanced use cases for syncing data with CRM apps. Few customization options when creating new records in Pipedrive. Drip creates a new Person each time a user triggers a certain action eg. clicks on an email. If someone clicks twice, you got yourself two identical records. If someone clicks 18 times, you’ll have some cleaning up to do later. We’re a marketing automation & insights tool that integrates tightly with Pipedrive. One of our first features is a powerful 2-way Pipedrive-Mailchimp integration. 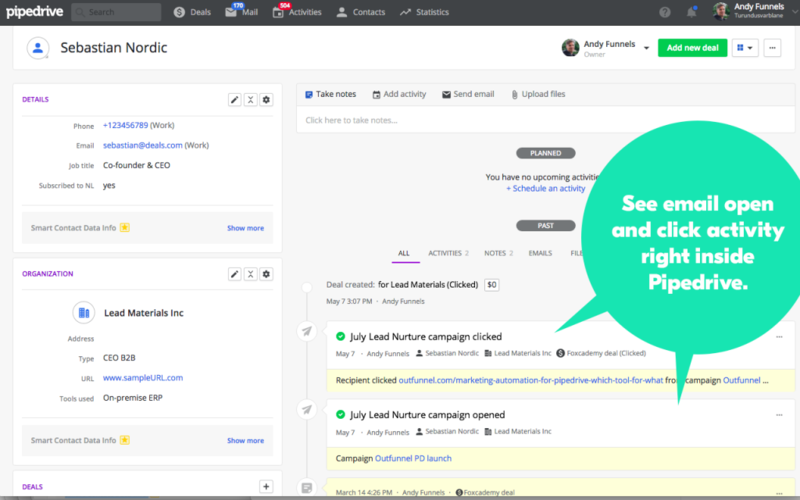 Mailchimp sends, opens and clicks are recorded in Pipedrive, so the sales team knows whom to call first. When people engage with lead nurturing campaigns, new Deals are created in Pipedrive. Add Pipedrive contacts or deals to Mailchimp as subscribers, keep databases in sync 24/7. Use Pipedrive filters to define which contacts are synced, so you don’t need to worry about exceeding contact limits on Mailchimp side. In addition to the seamless 2-way Pipedrive-Mailchimp integration, we also offer website visitor tracking which is tightly synced to Pipedrive. Outfunnel is a top rated marketing automation tool. See all reviews at Pipedrive marketplace. Alas, the tool doesn’t have a free trial available. We think it’s rather important to be able to use a tool without having to go through a sales process, and we wouldn’t recommend tools that don’t allow this. The user interface also doesn’t look too promising. Once you’ve gotten your email marketing sorted out, what do you do next? Lead capture forms are simple and effective tools for building your email list. Here are some of our favorites that play well with Pipedrive. If you’d need a simple web form with minimal integration hassle, you can’t go wrong with Pipedrive’s own web forms. They’re customizable, robust, integrate directly to Pipedrive and they’re free. We would have used on our beta signup page, but we wanted a more elegant in-page experience, and we didn’t have a huge amount of coding and design resource available, so after testing six different form builders we went with Paperform. We love the simplicity and design of Paperform, it’s also quite affordable (we’re using the $15 per month plan). The only downside is that there is no native integration, so you’d need to send new leads to Pipedrive via Zapier or a comparable 3rd party syncing tool. When you have a retail store that customers can walk into, you can learn a lot just from watching them. Where do they linger, what do they overlook? This can give you great insights about how you can improve the experience for them. Can you do the same with your website? One effective way to do this is via website visitor tracking. Our own website visitor tracking feature gives your sales team the context they need to prioritize leads and to know what to highlight or skip when they’re doing demos. Once you’ve enabled website visitor tracking, you’ll see who has been to your site, pages visited and the time of visits. 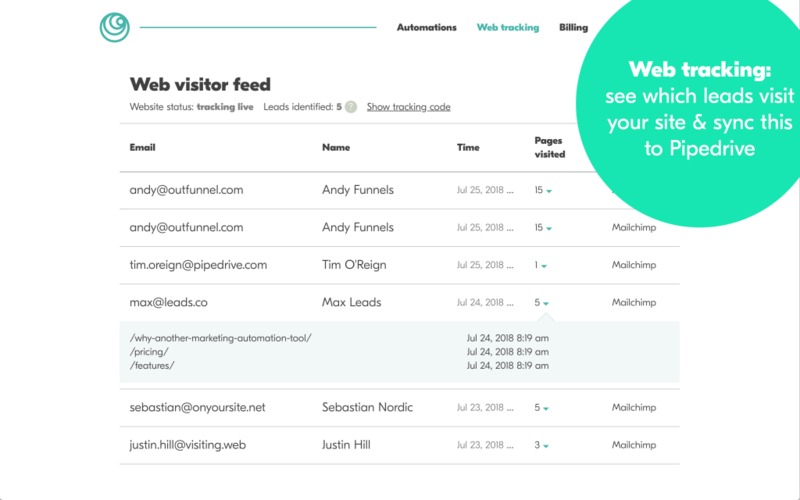 You’ll see a feed of web visitors when you log into Outfunnel, and you can also set up an automation that records these visits in Pipedrive. Have you had any interesting experiences or learnings when figuring out which marketing automation tools to use with Pipedrive? Let us know in the comments below!